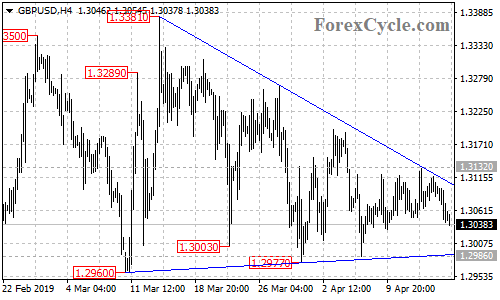 GBPUSD failed to breakout of the upper trend line of the triangle pattern on the 4-hour chart and pulled back from 1.3132. Another fall to test 1.2960 key support would likely be seen in the coming days, a breakdown below this level could take the price to 1.2800 zone. On the upside, a break of 1.3132 resistance would indicate that the downside movement from 1.3381 has ended, then the following upside movement could take the price to 1.3400 area.